Could not ever, with only two such letters. With mail art notifications prompt impulses. The violence of it, I could not bear and hardly undertook the “descent”, a pilgrimage, I understood later, of the soul. 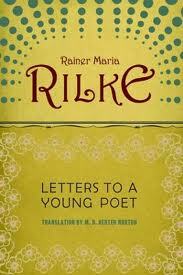 Rilke became for me a deterrent, the dragon at the gate. 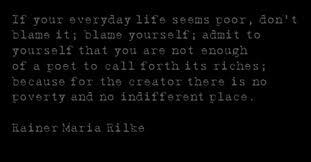 I had Rilke in horror: this discourager of talents, of nascent vocations perhaps…and wasted a lot of time. In my arrogance, I did not read further: I did not have the courage to pay the price. 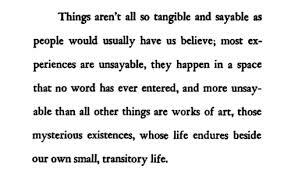 Then, paradoxically, he taught me later, when I finally- though involuntarily- took the journey, to understand and acquire a perspective on dragons, whatever scares me, all that disturbs me (my arrogance —> obstacles, discouragement, doubts) on my spiritual journey. 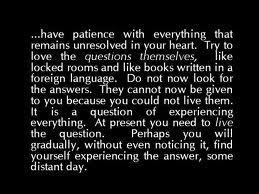 I may not have become a poet but I know now that I can live as one, and that’s more than I bargained for, negative or positive, depending on my resisting the process or not. whatever (: I pay dues in real currency. Your posts are dense. I slip into a natural gravitational orbit, upon entering your blog. I’ll visit soon your blog. When are you going to bed, Exchanger?